The system comes with an easy integration to existing systems, using a partner based file system interface. An integrated scheduler picks up data from directories. You could define as many directory to poll per partner as you like to. Each poll directory could be assigned with OFTP2 specific values like virtual filename or internal record format. The commercial version allows to send files directly to the server via commandline. After every send process or data transmission a user defined command or script could be executed. The commercial version (and the open source version, too) is not limited in the number of partners or transactions you are using - there will be no additional license costs if your business is expanding. The partners could be connected direct or as gateway partner or - if the system acts itself as gateway - as substations. You want to try before you buy? Checkout the open source version - it is a full functional OFTP2 system, too. If you are using the open source version of the mendelson OFTP2 you have to manage your keys using third party software. Using the integrated partner management you could setup your partners in an easy way. Define the security level, connection features and all partners key data here. The mendelson OFTP2 server allows to define substations to partner stations. These substations are not connected directly, instead the data is send to the direct partner with a routing request. It is also possible to define virtual local stations to send data with an other SFID code. That means that every mendelson OFTP2 system could be a OFTP2 gateway itself, act as a substation or connect to other stations/partners that are reachable via gateway only. On the protocol level the routing describes different values in the SSID/SFID. Even if the certificate exchange is not part of the OFTP2s RFC it is part of the OFTP2 implementation recommandation. The mendelson OFTP2 solution allows to exchange your certificates with your partners if their system implements this feature, too. The whole configuration including the partner settings, system settings, all poll threads and certificate assignments could be stored in a human-readable format (xml). Beneath restoring the whole configuration the system allows to restore single entries into a running system, e.g. import selected partners from this configuration. The commercial version allows to start an instance of the mendelson OFTP2 server from such a backup file, this allows to use several profiles. The mendelson OFTP2 will send you mail notification on several events - these could be chosen. The content of these mails could be modified by the user using simple templates. All notification templates are included in english and german. You could set up detailed logging levels in the user interface - up from a simple overview of what is transfered down to the protocol level and deep into the byte level of the OFTP2 protocol. I you are familiar with the OFTP2 protocol it will help you also to display all related OFTP2 protocol fields of the settings in the configuration user interface. Beneath this you have always an overview in a table of what has been transfered between which partners. 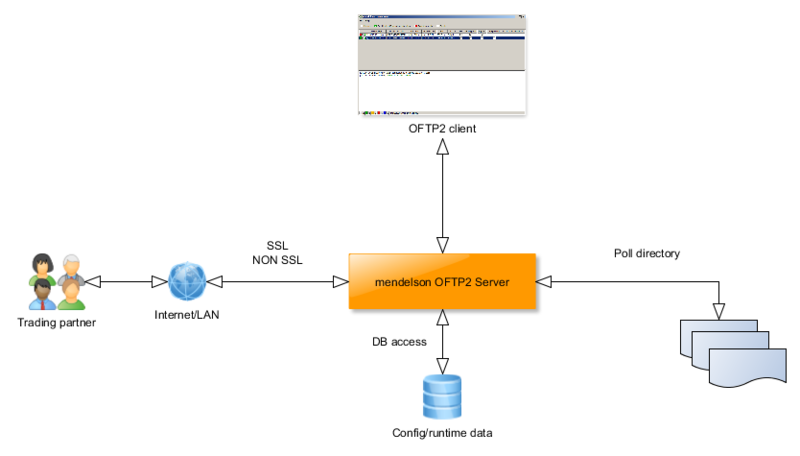 Using the commercial version of the mendelson OFTP2 server it's possible to start the server as an instance without user interface. On linux systems there is no X required to run the server. You could define users, these could log in from any other machine to the server, even from systems with other operation systems using the OFTP2 user interface. There runs a number of poll threads for every partner that polls special directories per partner and sends matching files to the configured partners. The transmission data is stored in an underlaying database system, this is installed out of the box, too. The OFTP2 client could run on a different machine (commercial version only) to connect to the server instance. Via an additional plugin it is possible to convert your data before sending it to a partner or after you have received it from your partner into or from any known EDI format, also all inhouse formats. The conversions could be created using the mendelson converter IDE.